Cantor’s Driving School gives private, one-on-one, on-the-road driving lessons 7 days a week, day and evening hours. Door-to-door service is provided – we pick you up and we drop you off at your school, work, house or apartment. You Must Have a Valid Nevada Instruction (Learner’s) Permit For Nevada Driver’s Test Services. Plus Packages – For any package that includes day-of-test service, Cantor’s Driving School must schedule the test. The test typically takes 3 hours. Please call 702-985-7993 after payment to schedule lessons. Package Payment Policy: All packages require online pre-payment for the entire package. Please call Cantor’s Driving School at 702-985-7993 to schedule your driving lessons after your registration and payment. Certificate of Completion: After 3 lessons/6 hours of behind-the-wheel driving lessons are completed, Cantor’s Driving School will issue a Certificate of Completion. This may be helpful with car insurance; check with provider. “Day-of-Test” Service Notes: Cantor’s Driving School MUST Schedule Your Drivers Test for “Plus” packages that include the “Day-of-Test” service. Cantor’s Driving School will coordinate with you and your driving instructor to schedule the date and time of your driver’s test. Please DO NOT schedule your driver’s test on your own. Driver’s Test Readiness – Cantor’s Driving School will determine if a student is ready to take the driver’s test. Cantor’s Driving School will not provide this service to students who are not ready. The Nevada thirty hour online driver’s education program from Cantor’s Driving School is a great way to prepare you for your driver’s examination. Courses are licensed by the Nevada Department of Motor Vehichles (DMV) and all first time drivers under the age of 18 in Nevada are required to take an approved 30-hour driver’s education course. You can register and begin your 30-Hour Online Driver’s Ed Course right now! View the Online Driver’s Ed page for details about this course. You can register for both the 15-Hour online driver’s ed course and the behind-the-wheel driving lessons right now! View the 15-5 section of the Online Driver’s Ed page for more details about this offering. Cantor’s Driving School offers private, one-on-one, on-the-road driving lessons 7 days a week, day and evening hours. Door-to-door service is provided – we pick you up and we drop you off at your home, work or school. “Plus” driver training packages include the “Day-of-Test” service. With this service, Cantor’s Driving School schedules your driving test with the Department of Motor Vehicles and accompanies you to the driving test. (Note: Cantor’s MUST schedule the test to make sure your instructor is available and scheduled to accompany you to the test. Please DO NOT schedule your driver’s test on your own.) A review lesson is provided prior to the test and you take the driving test in Cantor’s vehicle. Our state-certified instructor is with you from the time you are picked up until you receive your license and are returned home. Cantor’s provides the car insurance, vehicle registration and all paperwork necessary to make this process simple and convenient. Check Cantor’s Driving School’s Resources page for more information on what to bring for your driving test. 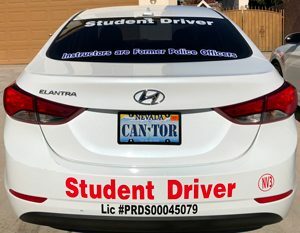 Cantor’s Driving School serves the Las Vegas NV area in Clark County, including Summerlin, Henderson, North Las Vegas, Boulder City and Paradise. To get started with driving lessons, call us at 702-985-7993or use our convenient contact form.